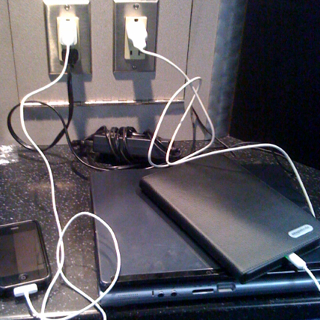 Love it when airports have power islands so you can re charge and be ready for the next flight. Also this is the first trip with the Kindle and so far it is pretty cool. Finished reading Gate House and two days worth of USA Today. The best thing is my briefcase is light and I can choose my next book from my "library". Hmmmmm what to read next?? ?